A day after appointing a committee to write the Declaration of Independence, the Second Continental Congress named another committee to write the Articles of Confederation. The members worked from June 1776 until November 1777, when they sent a draft to the states for ratification. On December 16, 1777, Virginia became the first state to ratify the Articles of Confederation. Maryland was the last, holding out until March 1, 1781. More of a treaty—or a "firm league of friendship"—than a constitution, the Articles of Confederation in no way infringed upon the sovereignty of the original thirteen states. Each state held "its sovereignty, freedom, and independence, and every power, jurisdiction, and right, which is not by this confederation expressly delegated to the United States, in Congress assembled." The Congress, the primary organ of the new national government, only had the power to declare war, appoint military officers, sign treaties, make alliances, appoint foreign ambassadors, and manage relations with the American Indians. All states were represented equally in Congress, and nine of the thirteen states had to approve a bill before it became law. Amendments required the approval of all the states. The Articles of Confederation represented an attempt to balance the sovereignty of the states with an effective national government. Under the Articles, the states, not Congress, had the power to tax. Congress could raise money only by asking the states for funds, borrowing from foreign governments, and selling western lands. In addition, Congress could not draft soldiers or regulate trade. There was no provision for national courts or a chief executive. Importantly, the Articles did not establish a genuinely republican government. Power was concentrated in a single assembly, rather than being divided, as in the state governments, into separate houses and branches. Further, members of the Confederation Congress were selected by state governments, not by the people. The Articles served as the nation’s plan of government until the US Constitution was ratified in 1788. Of Confederation and perpetual Union between the States of New-Hampshire, Massachusetts-Bay, Rhode Island and Providence Plantations, Connecticut, New-York, New-Jersey, Pennsylvania, Delaware, Maryland, Virginia, North-Carolina, South-Carolina and Georgia. 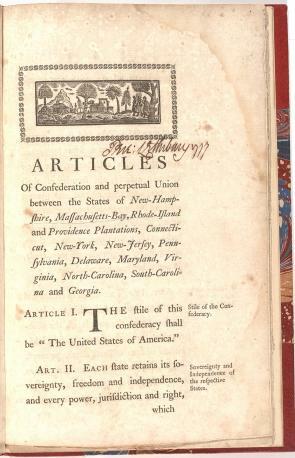 For the more convenient management of the general interests of the united states, delegates shall be annually appointed in such manner as the legislature of each state shall direct, to meet in congress on the first Monday in November, in every year, with a power reserved to each state to recall its delegates, or any of them, at any time within the year, and to send others in their stead, for the remainder of the year. . . .
Freedom of speech and debate in congress shall not be impeached or questioned in any court or place out of congress, and the members of congress shall be protected in their persons from arrests or imprisonments, during the time of their going to and from, and attendence on congress, except for treason, felony, or breach of the peace. . . .
Read the introduction and the document and apply your knowledge of American history in order to answer the following questions. Locate four provisions within the Articles of Confederation that indicate the concerns of the founding generation with the powers of a central government. How accurate is the following statement? The experience of having lived under a monarchy was largely responsible for the emphasis on sovereignty of the states under the Articles of Confederation. Critics of the Articles pointed out its weaknesses and shortcomings. Identify and explain four such areas in the Articles that were changed, altered, removed, or added in the Constitution. To what extent does the debate continue today over the power of the federal government?